A university student attends a protest inside Tehran University while a smoke grenade is thrown by anti-riot Iranian police, in Tehran, Iran,, Dec. 30, 2017. This photo was taken by an individual not employed by the Associated Press and obtained by the AP outside of Iran. Iran's leader blamed his "enemies" for the protests, which continue to grow. The streets and public squares of Iran are usually places ruled by a strict code of conduct — Islamic dress and customs are the law. 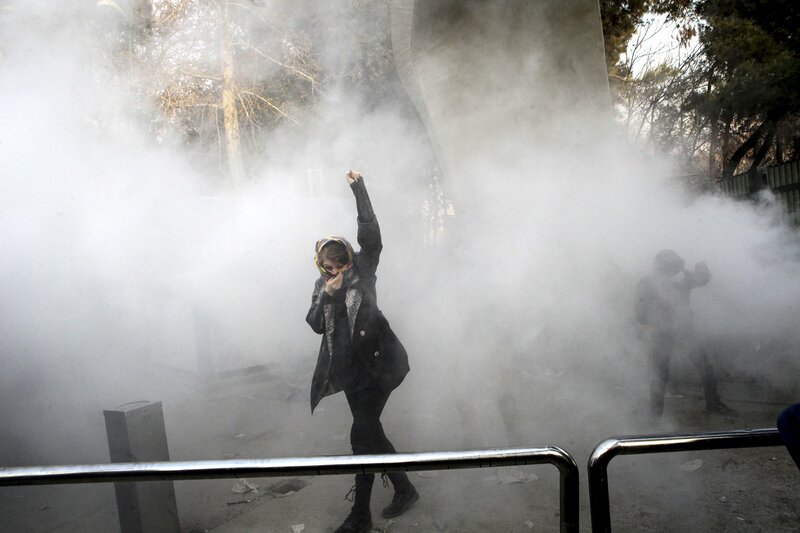 But over the past few days, cities across the country have erupted into riotous protests by Iranians and clashes with the Iranian Revolutionary Guard as citizens have demanded greater freedom and better treatment from the ruling regime, including Ayatollah Ali Khamenei. The clashes have left 21 dead and led to 450 arrests, according to The New York Times. Photos and videos from protesters show women participating in and tweeting about the protests, demanding more freedom from Islamic laws that have long limited their rights. Global Citizen campaigns on gender equality around the world, including encouraging governments to ensure that their laws are fair and equal. You can take action here. The protests, which began last Thursday in the city of Mashhad, are the largest since 2009, when demonstrators disputed the results of a presidential election, according to the BBC. This time the initial protests began as a way to criticize rising prices and government corruption, but have broadened, according to the BBC. Khamenei, the Iranian supreme leader, said that discord and protests were sown by "enemies" who used intelligence services, politics, weapons, and money to inspire revolt, while United States President Donald Trump encouraged the protesters, as did Israeli Prime Minister Benjamin Netanyahu, according to the Times. Iranian students protest at the University of Tehran during a demonstration driven by anger over economic problems, in the capital Tehran on December 30, 2017. 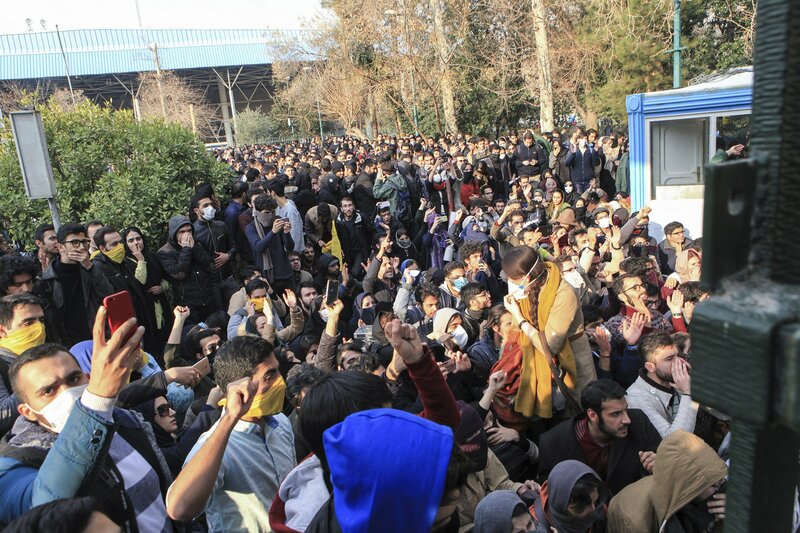 Students protested in a third day of demonstrations sparked by anger over Iran's economic problems, videos on social media showed, but were outnumbered by counter-demonstrators. People gather to protest over high cost of living in Tehran, Iran on December 30, 2017. A university student attends a protest inside Tehran University while a smoke grenade is thrown by anti-riot Iranian police, in Tehran, Iran, Saturday, Dec. 30, 2017. A wave of spontaneous protests over Iran's weak economy swept into Tehran on Saturday, with college students and others chanting against the government just hours after hard-liners held their own rally in support of the Islamic Republic's clerical establishment. This photo was taken by an individual not employed by the Associated Press and obtained by the AP outside Iran. University students attend a protest inside Tehran University while anti-riot Iranian police prevent them to join other protestors, in Tehran, Iran, Saturday, Dec. 30, 2017. This photo was taken by an individual not employed by the Associated Press and obtained by the AP outside Iran. Demonstrators gather to protest in Tehran, Iran on December 30, 2017. People gather to protest in Tehran, Iran on December 30, 2017. A wave of spontaneous protests over Iran's weak economy swept into Tehran, with college students and others chanting against the government.